Praise be to the God and Father of our Lord Jesus Christ! In his great mercy he has given us new birth into a living hope through … Jesus Christ. My son Hunter had been having pain in his left elbow. He mentioned it to my husband and I casually, but didn’t make a big deal about it initially. He’s a teenager, so we thought it might just be growing pains. Months later, when the pain continued to increase, he brought it up to us again. Off to the doctor we went, not knowing what to think about the mysterious, lingering pain. After a brief physical evaluation, the doctor ordered that x-rays be taken. Soon after, he peeked his head back in the exam room and gave me the “come with me” finger-wag. I followed him out to the light board that illuminated Hunter’s new bone pictures. Dr. Joe started off with this simple statement. “Hunter has a bone problem.” He went on to explain that he had an OCD lesion, and that it needed to be dealt with in order for him to experience relief from the pain and healing in his arm. Lots of follow up appointments followed. We met with a surgeon who specializes in elbows and shoulders, and gathered all the information we needed. Hunter had X-rays, MRIs, and MRIs with dye. He was poked and prodded and pressed. The professional conclusions were this: if Hunter’s elbow wasn’t fixed now, later in life it would completely lock up, rendering his arm unbendable. Our response? Elbow surgery it is! The morning of surgery, the nurse got his IV started and prepped his arm by cleaning it up really good. Then they carted Hunter away and the surgeon began his work. During surgery the bad areas of Hunter’s bone were removed, and then the doctor micro-fractured the area to cause bleeding. The fracturing of his bone exposed blood to the place of pain, which ultimately led him to fresh growth and healing. I just can’t think of Hunter’s elbow surgery without thinking of Jesus. Similarly, His body needed to be broken so that blood could flow and healing could happen. This is the simple Gospel. The good news! The very reason we celebrate Christmas. God’s love was poured out on humanity through the blood that was shed by Jesus. The Son of God left His place of perfection in heaven and came to earth to mend our hearts and hurts. He became broken for us on a Roman cross so that we could know forgiveness and healing. This is the hope we sing of at Christmas. Our Bethlehem song! When Hunter first came to us we didn’t know anything was really wrong – just that there was a pain that needed addressed. Do you know today that there is something wrong in your life? Perhaps you can’t quite put your finger on it, but sense there is more to faith than what you know. More to Jesus than what you’ve explored or accepted. 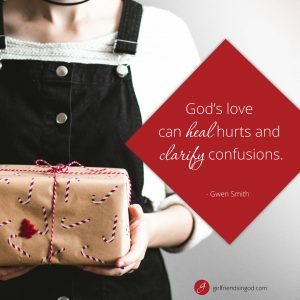 Are you struggling with pain, emptiness, insecurity, depression, fear, or anger? Got any areas of brokenness and rebellion that keep are keeping you from fully developing spiritually? 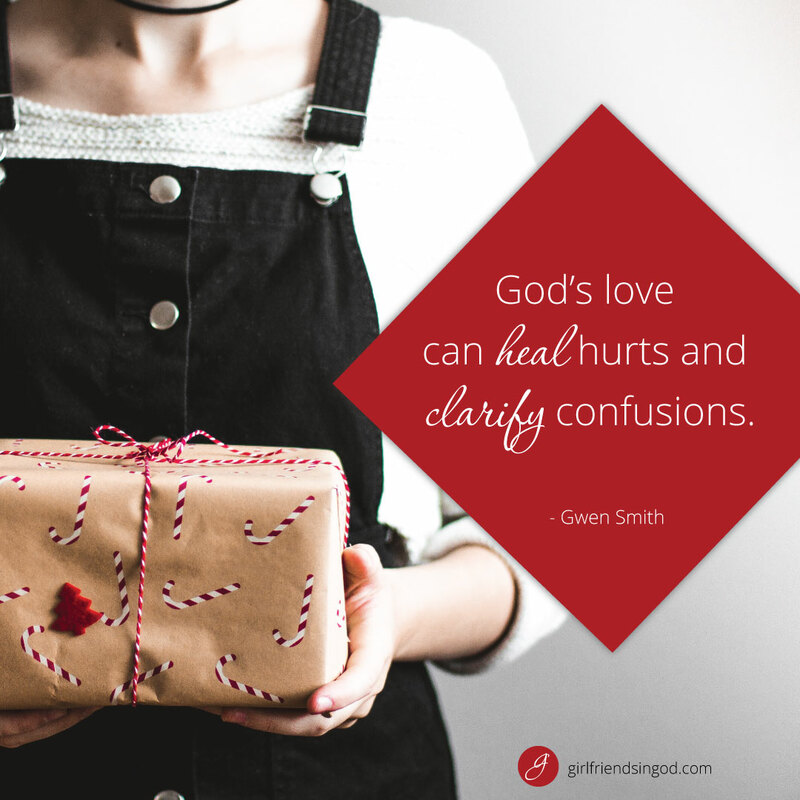 Through the finished work of Jesus, God invites us to know complete healing and forgiveness. Are you ready to celebrate Christmas knowing the true gift of love and hope this year? Dear Lord, I need healing today. I need You, Jesus. Please forgive my sins and restore my hope. Help me to grow in Your love and to experience the purity and full life you promise in Your Word. Where does this message find you today? Spend some time in prayer. Then find me on Instagram and tell me about it in the comments section for today’s post! Got things in your past you’d like to forget or things in your present stressing you out? Ready for soul-level healing? Read Gwen’s book Broken Into Beautiful. Every step of forgiveness begins with the heart of God. If you’d like to learn more about how your brokenness can be transformed into a picture of God’s beauty, get your copy today. Order from Amazon or, for a signed copy visit Gwen’s web store. Download this FREE Ebook and let God bring you beyond your challenges to His healing, strength and hope. Praying now for your ankle, Francine! Thank you for this, it is how God has been healing me and my back and I didn’t even know it. There was no way I wanted surgery, praise Him, I don’t need it. If someone does that is fine, but some things only He can fix. Have very Merry Christmas.